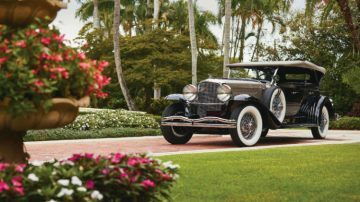 A 1930 Duesenberg Model J ‘Sweep Panel’ Dual-Cowl Phaeton is the leading American classic car announced for the RM Sotheby’s Amelia Island 2019 classic car auction. 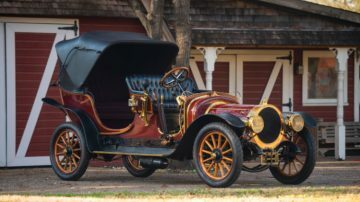 RM Sotheby’s announced a large number of important American pre-war cars and brass era automobiles for the Amelia Island auction on 8-9 March 2019 in Florida. The group is led by a 1930 Duesenberg Model J ‘Sweep Panel’ Dual-Cowl Phaeton by LeBaron (Est. $1,600,000 – $2,000,000). The 1934 Packard Twelve Convertible Sedan Custom (Est. $1,250,000 – $1,500,000) and 1932 Stutz DV-32 Convertible Victoria by Rollston (Est. $750,000 – $1,000,000) are hardly less impressive. The Brass Era automobiles are headed by a French 1909 Delaunay-Belleville Type IA Victoria by Brewster (Est. $250,000 – $325,000). RM Sotheby’s 21st annual Amelia Island classic car sale – 8 & 9 March 2019 at the Ritz-Carlton, Amelia Island, Florida, USA. 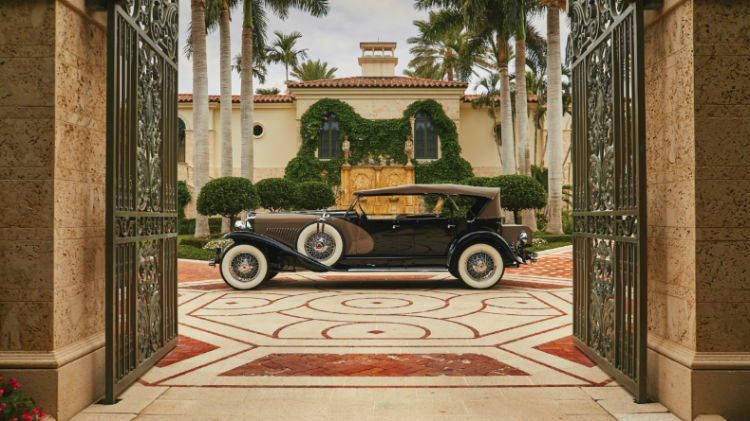 In 2019, RM Sotheby’s earned $38.1 million at Amelia Island with a sell-through rate of 84%. In 2018, RM Sotheby’s grossed $27 million with a sell-through rate of 85% with 87 of 102 lots offered sold. In 2017, RM Sotheby’s earned an Amelia Island record $70.9 million but in contrast to most years, a second auction day was held during which 63 cars from the Orin Smith collection were sold without reserve to earn a total of $31 million. In 2016, RM Sotheby’s earned $38.6 million with a high sell-through rate of 89%. In 2015, RM Sotheby’s earned $60 million at Amelia Island with a remarkably high 98% sell-through rate. 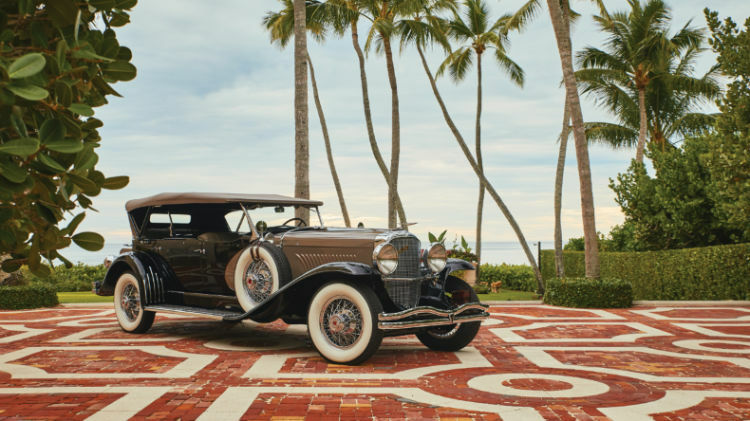 The early lead car for RM Sotheby’s Amelia Island 2019 classic car auction is a unique 1930 Duesenberg Model J ‘Sweep Panel’ Dual-Cowl Phaeton by LeBaron, chassis 2336, engine J-487, (Est. $1,600,000 – $2,000,000). 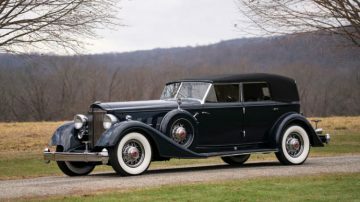 Only 18 examples were ever produced of the iconic ‘Sweep Panel’ Dual-Cowl Phaeton body style with engine no. J-487 the only one on the long 153½-in. wheelbase. This Duesenberg, fully restored to concours-quality from the ground up by the renowned Fran Roxas, is finished in a stunning rich black and café au lait combination, highlighted by a subtle red pinstripe that delineates the iconic sweep panel, providing a handsome match to the tan cloth top and sumptuous leather interior, with its distinctive engine-turned dashboard. It is an exceptional example of the marque, and one with a known and continuous history from new, which has always been well maintained and cared for throughout its life, as evidenced by its ACD Club Category One Certification. 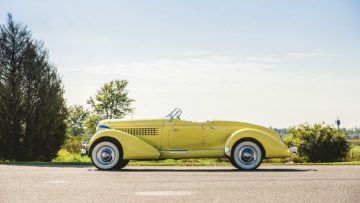 The only factory non-supercharged 1935 Auburn Eight Custom Speedster, offered without reserve from the esteemed Richard L. Burdick Collection, from which strong results were achieved in Arizona ($500,000 – $650,000, offered without reserve). An authentic 1934 Packard Twelve Convertible Sedan Custom, offered fresh to the market following an exceptional restoration (Est. $1,250,000 – $1,500,000). A 1931 Packard Deluxe Eight Convertible Roadster by Derham, formerly of the Julian Eccles and James Weston Collections, retained its original chassis, engine and bodywork (Est. $650,000 – $750,000). A 1932 Stutz DV-32 Convertible Victoria by Rollston, formerly of the Imperial Palace and Michael Calore Collections, is one of just five built to this design on DV-32 chassis and an AACA and CCCA 100-point Senior First Prize winner (Est. $750,000 – $1,000,000).